Sometimes I feel like I’m trapped in the movie “Benjamin Buttons”. 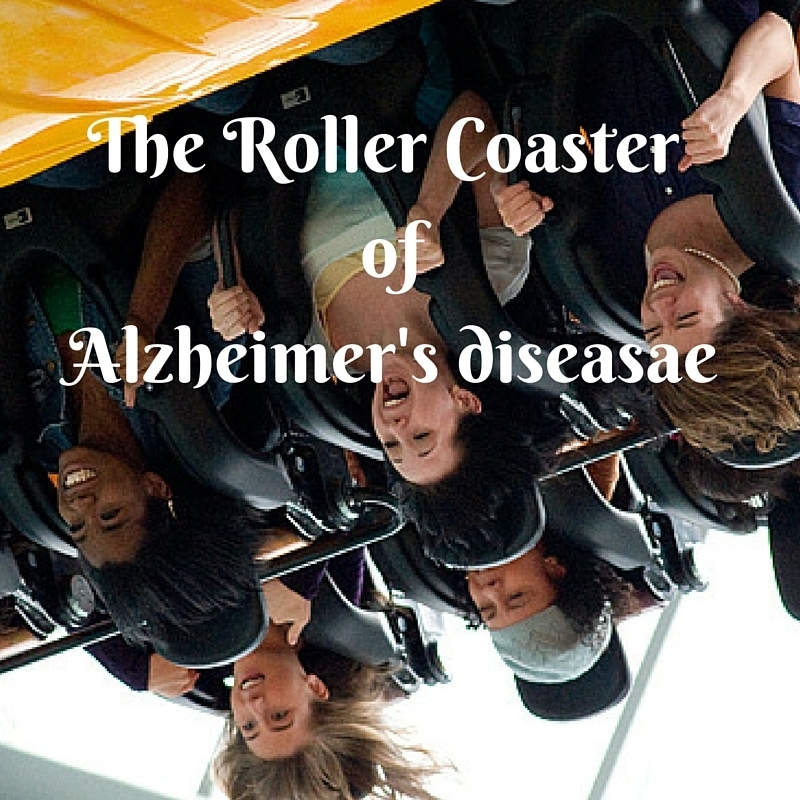 In my opinion only, Alzheimer’s Disease takes a person’s mind and spins it backwards at alarming speeds. My mom was a very strong, independent woman who is now, at times, a sulky, pouty, emotional teenager. It’s like she is moving backwards through her own life. I can’t imagine anything more frightening. In my mind, which we all know isn’t completely trustworthy. I consider life to be just like a roller coaster. It’s full of twists and turns. We all have ups and downs. Then right when you get to those last couple of turns and that last big hill something goes horribly wrong. Technical difficulties aka Alzheimer’s Disease. The ride stops and at first you don’t panic its just a small glitch and you’ll carry on shortly. Instead of rolling forward like you have been doing the whole ride you start moving backwards. Slowly at first, you hardly even notice. As it picks up speed then you start to worry a little, still you don’t panic… yet. Faster and faster it goes and images are flashing by quicker and quicker until it becomes blurring and confusing. It rolls out of control until all you can do is hold on for dear life. Eyes closed, head down you just want it to stop or at the very least slow down a little bit. It goes so fast that you give up and just want a soft place to land when it’s over. Can you just imagine how scary it must be for the one actually suffering from the disease? I am only the caregiver. I have no idea what goes on inside my mother’s head. I have some ideas from all of the information I have picked up and books that I have read. I try to draw her out and get her to talk about all those feelings she must be feeling. My mother is not a talker. She is a suffer in silence kind of person, so it leaves me clueless to how she is really feeling about it. Is she angry, is she scared, is she depressed I would have to say yes to all of these, but I don’t really know for sure. I have to go by what she doesn’t say, her body language and her facial features. It sometimes makes me so sad that I cannot be that shoulder to lean on for her. That she feels that she has to suffer in silence. I want her to be able to turn to me and she does for a lot of things in life but not this. These are the most important changes that she will ever go through. These changes where she will need me more than at any other time in her life. Really though, can you imagine anything more terrifying than Alzheimer’s Disease when you can’t focus on your future, you can’t even focus on your right now? Hopefully the past she focuses on is the happy elements of the past. I think knowing you are there for her even if she is angry and pouty is enough for her and makes words completely unnecessary. I hope so Laura! It is so hard not knowing what she is thinking about. Thanks for commenting! Thanks, Pia! That’s it exactly the fear of the “unknown” that scares me the worst. I never know what to expect. Absolutely terrifying! So glad she has you to cling to. I am too Diane. I can’t imagine what it must be like to live inside her mind. as you well know it is scary and heartbreaking for the family to go through. My mother in law was the same way – she never wanted to talk about things, so it was hard to know what she was thinking. This is a great analogy, I think. So scary for the patient, but also the caregivers. It is sometimes so frustrating and heartbreaking at the same time. I know there are times when she is scared to death and I feel that way all the time. It is Michelle, but there are plenty of good days in between and that makes it all okay in the end. I know it will get alot worse and end badly but for today we are okay and that’s really all we have. Terrifying, I am sure – but it would be so much more so for her Rena, if she did not have you. Thank you Susan I appreciate that! What a perfect analogy for getting your point across. Although your mom suffers in silence, you are there reading the cues and helping her along nonetheless. Thanks Karen, I’m so glad you like it. Thanks Karen I always appreciate your support!